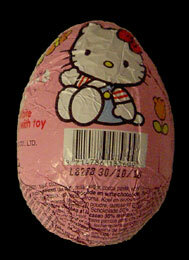 These Hello Kitty Chocolate Eggs are the first line of attack, with larger more conventional Easter Eggs also available. However, there's only so far I will go for the sake of a review, so you'll have to content yourself with the small ones. To start with let's go for first impressions. The eggs are about 8cm in length, which makes them roughly the same size as a Kinder Surprise Egg, and come wrapped in sickeningly pink foil. This cutesy wrapper promises a milk and white chocolate egg with a toy inside. Sound familiar? 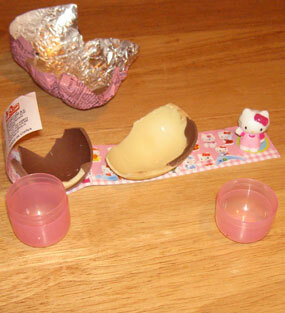 Yes, not only is it the same size as a Kinder Egg, it also boasts a similar chocolate and crap toy combo. The egg itself is at least slightly different than you may expect. Instead of having a layer of milk chocolate covering a layer of white chocolate, one half is milk chocolate and one half white. Inside is a small pink capsule that contains a single 2cm tall Kitty figure from a range of 24, and a piece of paper showing the entire range. The chocolate is actually tastier than I expected, and the figure is cute, even if it is shoddily painted and features visible moulding lines. You don't expect too much for 79p a pop, and by that token it's not that bad. Truth be told this is another perfect example of how Sanrio will cynically take any existing product, slap Kitty's face on it and sell it as their own. However, this marketing strategy appears to have been working pretty well since the 70's and shows no signs of stopping any time soon. These eggs are Kinder Eggs with less tasty chocolate but a better toy (well, at least you recognise it), but it's worth bearing in mind that picking up the entire range before they disappear off the shelves after Easter is going to be a pretty difficult task. At 79p each they're cheap as far as anime merchandise goes, but pretty much every chocolate bar on the shelf is cheaper and more satisfying. One for Kitty-philes only. A small pink capsule and a piece of paper showing the 24 Kitty figures in the range, plus the figure itself which is ok.